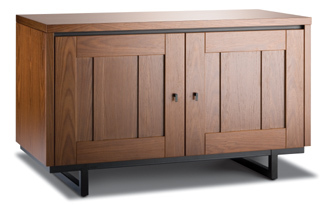 The following companies manufacture Audio-Video Furniture, Speaker Stands, and Media Storage Furniture and Racks. You can obtain more information on any of the models by clicking on that manufacturer's link on our Brands & Links page. Because of the overwhelming number of styles, options, finishes, and sizes, we can't list all of them here. We've listed the main lines for each brand and described some of the models, options, and prices. Please feel free to contact us for detailed information and pricing and to get help with designing your ideal configuration. Archetype is a unique line of open-style racks using very attractive wood shelves in black, cherry, maple, and walnut finishes. The shelves are mounted on threaded rods that provide for a very sturdy and stable configuration. Shelves are continuously adjustable. Model 2.0, 3.0, and 5.0 racks are 22.5 inches wide and have two, three, and five shelves, respectively. ($120 to $400) These can be stacked to create taller configurations. Accessories such as rear panels, spikes, bookends, and stacking kits are available. Synergy is a highly-flexible and creative modular design which comprises all possibilities from single-width, open-rack styles to large, multi-unit assemblies with doors and side panels. Thus you can have either an open or enclosed furniture look. 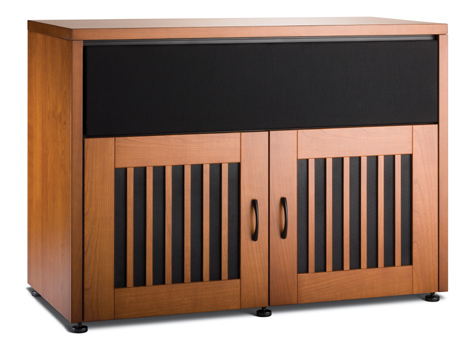 Synergy units come in black, maple, walnut, and cherry and have black or aluminum posts at the corners. These have slots that hold shelves, side panels, doors, and other accessories. All shelves are completely adjustable. Single racks are 23.75 inches wide and come in 21, 31, and 41 inch heights. ($299 to $549) These can be stacked to create taller configurations. The stacking extensions cost somewhat less than the full units. Twin racks are 44.5 inches wide and come in 12, 21, 31, and 41 inch heights. (499 to $899) These can be stacked to create taller configurations. The stacking extensions cost somewhat less than the full units. Triple racks are 65.75 inches wide and come in 12, 21, 31, and 41 inch heights. ($699 to $1299) These can be stacked to create taller configurations. The stacking extensions cost somewhat less than the full units. Bridges are available in all four finishes and in several widths, including one adjustable-width model (black only). These bridges can be used to join any of the above cabinets horizontally to create wider units. They allow separations from 39 to 72 inches. ($199) Salamander will also make custom widths to your specifications. ($299) These are great places to locate large TVs or flat-panel displays. Media Storage cabinets are available at 41 inches high and in the same style and finishes as the above cabinets but with less depth. ($599) These can also be fitted with doors. Accessories such as Saturn wheels, polished aluminum feet, lighting, glass shelves, rear panel extensions, and flat-panel TV mounting brackets that suspend the TV over the cabinet are also available. The Chameleon line was introduced in early 2007 to serve two needs. These were (1) to provide models compatible with more traditional decors, models with a more "finished furniture" look and (2) to offer products which would not require extensive assembly by the customer. There are nine different styles in this series. They are (1) Sonoma, a mission-influenced design sporting an American cherry finish, (2) Hampton, a distressed, black, English country look, (3) Geneva, a medium walnut style, (4) Berlin, a contemporary, dark wenge wood design, (5) Barcelona, a contemporary, urban, metropolitan style in natural cherry with a black aluminum framed and smoked glass doors, (6) Corsica, a Contemporary, coastal look in American cherry with extra thick end panels, a black glass top, and wood-framed, smoked-glass doors, (7) Elba, a traditional design in American cherry with wood-framed, smoked-glass doors and an extra-thick top, (8) Oslo, a contemporary style with aluminum-framed, smoked-glass doors and a dark Wenge, glass top, and (9) Venice, a traditional, antique format in a cherry-glazed finish with brass fittings. Most of the nine styles come in 14 different sizes, four "single" units that are about 23 inches wide and differing heights, three "twin" units that are 44 inches wide and differing heights five "triples" that are about 65 inches wide and differing heights, and two "quad" units that are 88 inches wide and differing heights. This makes a uge number of different choices ranging from $799 to $2999. The various models have different door, center channel shelf, and other options to optimize them for different uses. These units come out of the box mostly assembled and need very little effort to complete. This is some of the most attractive furniture that Salamander Designs has ever offered, and it is both functional and well-designed for audio-video use. There are a few options such as wheels, media trays, cooling fans, flat-panel TV mounts, surge suppressors, and others, but these are mainly accessories. The basic units are pre-configured and not customizable. The pictures shown here and on the Salamander Design's website will give you some idea of how pretty this furniture is. All can be configured as single chairs or as joined groups of multiple chairs and come in a wide variety of fabrics, leathers, and woods. (You can even supply your own custom fabric, if you wish.) They are also available both as motorized and manual versions. For more information on these lines, please click the Salamander Designs link on our Brand Names & Links page and click the "home Theater Seating" link. for pricing on these chairs, please visit the Salamander Designs website configurator.